During Chinese New Year, my family, my grandparents and I went to Bangkok,Thailand for 4 days. Shaun TiTi and I were very excited to go to Bangkok as we have never been there before. We went to the airport by taxi. The taxi was easy to book as the taxi driver was Dadi's friend, Uncle Sharidan. 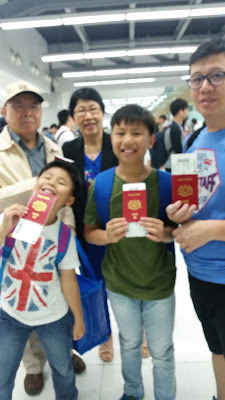 Once we reached the airport, we met our grandparents there. They ran to us and hugged us. We felt very happy. As Dadi was an Enrich member, we could enter a priority lane and also a Golden Lounge. We met friendly staff who allowed Shaun TiTi and I to enter the lounge free. The food in the lounge was very tasty with a good variety. I ate lots of bread, some yogurt and a bowl of Wan Ton Mee. I also drank some soft drinks. Shaun Titi ate Nasi Lemak without Sambal as he cannot take spicy food. Our family enjoyed the food and drinks in the lounge. Our journey on the plane was wonderful as there was no flight delay. We sat down on our seats while getting ready to take off. There was a safety video before we took off. The Captain told all the crew members to sit down and prepare for take off. The plane started to move along the runway making a funny sound. It started to move faster and faster and then we were airborne and on our way to Bangkok. We had some food on the plane as we were hungry. We ate some rice with sweet and sour chicken. The food was very tasty. I gobbled all the food into my mouth. We also had some drinks, I drank apple juice and my brother drank some orange juice. We watched some movies on the plane such as The Peanut Movie. The movie was funny, as it was about a boy named Charlie Brown who was always a loser. Charlie Brown had a dog called Snoopy, he wrote a love story about how it met a female dog. In the end, Charlie fell in love with a girl and Snoopy finished his love story with a happy ending. We finally arrived in Bangkok! It felt so nice to touch the ground. Bangkok was very cold because there was a cold front blowing from China. We got off the plane and went to collect our bags. Our bags came quickly as our bags had a priority tag. We went straight to the taxi and the taxi driver drove us to our hotel.